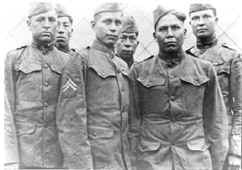 In the closing days of World War I, fourteen Choctaw Indian men in the Army’s Thirty-Sixth Division, trained to use their language, helped the American Expeditionary Force win several key battles in the Meuse-Argonne Campaign in France, the final big German push of the war. The fourteen Choctaw Code Talkers were Albert Billy, Mitchell Bobb, Victor Brown, Ben Caterby, James Edwards, Tobias Frazer, Ben Hampton, Solomon Louis, Pete Maytubby, Jeff Nelson, Joseph Oklahombi, Robert Taylor, Calvin Wilson, and Walter Veach. With at least one Choctaw man placed in each field company headquarters, they handled military communications by field telephone, translated radio messages into the Choctaw language, and wrote field orders to be carried by “runners” between the various companies. The German army, which captured about one out of four messengers, never deciphered the messages written in Choctaw. The Choctaws were recognized as the first to use their native language as an unbreakable code in World War I. The Choctaw language was again used in World War II. Choctaws conversed in their language over field radios to coordinate military positions, giving exact details and locations without fear of German interception. The Army taps Hopi, Choctaw, Comanche, Kiowa, Winnebago, Seminole, Navajo and Cherokee Americans to use their languages as secret code in World War II. The Marines rely on Navajos to create and memorize a code based on the complex Navajo language. During the annual Choctaw Labor Day Festival in 1986, Chief Hollis E. Roberts presented posthumous Choctaw Nation Medals of Valor to the families of the Code Talkers. This was the first official recognition the Choctaw Code Talkers had been given. On November 3, 1989, in recognition of the important role the Choctaw Code Talkers played during World War I, the French government presented Chief Roberts with the “Chevalier de L’Ordre National du Merite” (the Knight of the National Order of Merit), the highest honor France can bestow. Unbelievable, these men have never been honored by their country. In the closing days of World War I, eight Choctaw Indians were instrumental in helping the American Expeditionary Force to win several key battles in the Meusse Argonne Campaign, which proved to be the final big German push of that war. These Brave soldiers were the now famous Choctaw Code Talkers. One of the eight was from Bryan County, Oklahoma and one was from Choctaw County and the remaining six were from McCurtain County. They were Solomon Lewis, Bennington; Ben Carterby, (Bismark) Wright City, Mitchell Bobb, Smithville; Robert Taylor, Bokehito or Boswell; Ca’vin Nelson, Kullitukle; Pete Maytubby, Borken Bow; James Edwards, Ida (now Battiest) and Jeff Wilson, Goodwater. All of these men were serving in the same battalion, which was practically surrounded by the German Army. And, to make matters worse, it was known that the Germans had “broken” the American radio codes and had tapped the telephone lines. The Germans were also capturing about one out of every four messengers sent out as runners between the various companies on the battle line. One day, a Captain Lawrence, Commander of one of the companies, was strolling through the company area when he happened to overhear Solomon Lewis and Mitchell Bobb conversing in their native Choctaw language. “I think Carterby and Maytubby are over there, Sir.” Lewis replied. “You fellows sit right here,” said the Captain. He got on the field telephone and discovered that, indeed, Ben Carterby and Pete Maytubby were attached to Headquarters Company. It was at that moment that PFC Mitchell Bobb, using field telephone, delivered the first Choctaw Code Message to Choctaw Ben Carterby, who then translated it into English for the Battalion commander. Within a matter of hours, the eight men able to speak the Choctaw Language had been shifted until there was at least one in each field company headquarters. Not only were they handling field telephone calls, they were translating radio messages into the Choctaw Language and writing field order to be carried by “runners” between the various companies. The Berman code experts were “flipping their wigs” trying to break the new American code. With in 72 hours after the Choctaw language was pressed into service, the tide of battle had turned, and in less than 72 hours, the German Army was retreating and the Allied Forces were on full attack. Since this occurred at the close of the war, the Choctaw Code Talkers were apparently used in only this one campaign. The men were praised by their company commanders and the battalion commander. Thought these men were promised medals for their contributions to end the war, they have never been received. The information contained in this history of the Choctaw Code talkers was told to the writer of the article by Solomon Lewis in 1979, who at that time, was the only remaining Code talker alive. Solomon Lewis died sometime between 1982 and 1983. With Thanks to the Bryan County Heritage Quarterly. American Indian Medal of Honor Winners – In the 20th century, five American Indians have been among those soldiers to be distinguished by receiving the United States’ highest military honor: the Medal of Honor. Bishinik – The Official Publication of the Choctaw Nation, August 1986.
Who were the Choctaw code talkers? Code Talkers – Mosai Ne-ahs-jah Be Dzeh – What does this mean? As World War I drew to a close, the United States had a continuing problem of phone calls being intercepted by German forces. One could be fairly certain that a German spy would hear any telephone call made. Unfortunately, voice-scrambling technology wouldn’t be invented for decades. The United States came up with several inventive solutions to the problem, but unfortunately none of them worked for any length of time. First, the Army tried trench codes. They worked for a time, but after they had been in use for a while, the Germans readily cracked them. Another solution, sending messengers between camps, failed because Germans captured about one in four. So, what was the Army to do? One smart commander, Captain Lewis, realized that the languages used by American Indians are extremely complex and difficult to learn. He capitalized on the complexity as a code, employing eight Choctaw Indians during the Mousse-Argonne campaign, which turned out as the final German push of the war. Simply put, the Indians were stationed at command posts, and spoke all important telephone calls in their native language, translating from and into English for their commanders. German intelligence wasn’t able to figure out what the new American code was or to even think about breaking it. Within 24 hours of the United States starting to use Choctow Indians language as a form of encryption, the tides of war changed in favor of the United States. Within 72 hours, the Germans were in retreat. The Choctow weren’t used again in an unclassified military effort (other data may still be classified). However, the Navajo tribe was utilized in World War II, where they had equal effectiveness at stumping German cryptographers. When World War I broke out a huge percentage of Choctaw men volunteered, along with about 10,000 other Native Americans, for service in the U.S. Military. The language the Choctaws spoke was considered obsolete. That same language later helped bring about a successful end to the war by confounding German eavesdroppers. During World War I, with the tapping of the American Army’s phone lines, the Germans were able to learn the location of where the Allied Forces were stationed at, as well as where supplies were kept. An idea was born to put Choctaw Indians on the phones and let them talk in their Native speech. The German soldiers had never heard this language before. The Choctaw Nation also had tribal members who used their language to transmit messages in World War II. The native language was an excellent tool to use on behalf of the American forces in both wars. Until the use of the Choctaw language in World War I, the Germans had decoded all transmitted messages sent by the Allied Forces. “The Choctaw Nation is very proud of the story of the original Code Talkers, and even has a granite monument at the entrance to our capitol grounds that bears the engraved names of the men who used the Choctaw language to help win World War I,” said Chief Gregory E. Pyle. “The language is so important to the tribe today that there are classes offered in 43 public schools, two colleges and three universities, as well as on the Internet and in many community centers.” Verbal history, combined with written history, has revealed the names of the 18 Choctaws who were trained to use their own language to transmit messages that the enemy was never able to decipher. These men were Tobias Frazier, Victor Brown, Joseph Oklahombi, Ben Hampton, Albert Billy, Walter Veach, Ben Carterby, James Edwards, Solomon Louis, Pete Maytubby, Michell Bobb, Calvin Wilson, Jeff Nelson, Joseph Davenport, George Davenport, Noel Johnson, Otis Leader and Robert Taylor. Originally, only eight men were asked to be Choctaw Code Talkers, but as the success of using their native language as a “code” was recognized, others were quickly pressed into service. When the Choctaw tongue was spoken over the field telephones, the Germans stopped attacking the supply dumps and counter attacking the American troops. This is because they had no idea what the Choctaws were saying and couldn’t effectively spy on the message transmissions. A captured German officer later said they were completely confused by the “code”. The Choctaw Nation of Oklahoma has formalized a request to Congress that recognition be given to the Native American Code Talkers of all tribes who used their own language during WWI or WWII as a “code” to confuse the enemy. Honor from the United States Government to these unsung heroes is long overdue. Not something I knew a whole lot about until now. Enjoyed information on Oklahoma Choctaw Code Talkers. 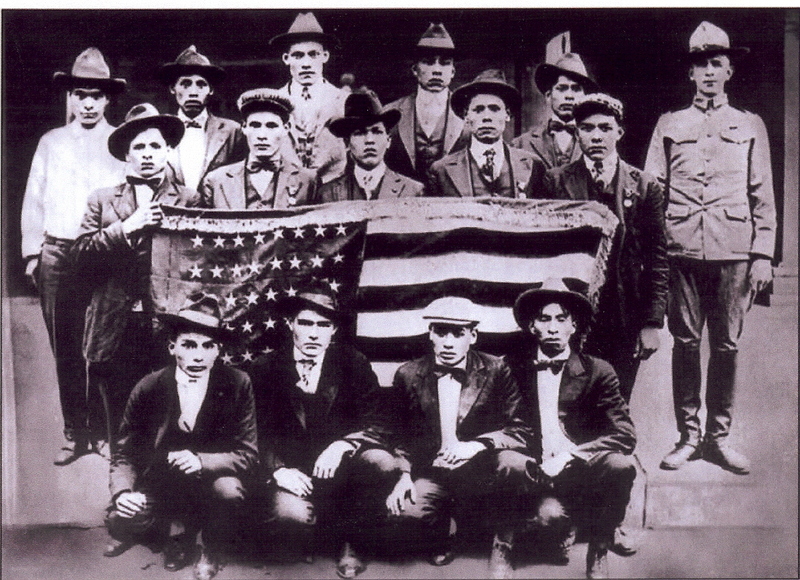 Do you have any information on WW I Choctaw Code Talkers from Mississippi? Has John Bell from Neshoba County, MS, been documented as a WW I Choctaw Code Talker? We wish documentation and pictures if available. I am inquiring about Ben Hampton. My great grandfather was Alfred E. Hampton. I was wondering if Ben was related to this man. Can anyone help with this? Thanks. who is Ben Hampton’s family. I am a descendant of Alfred E. Hampton and am wondering if there is any relative connection. thanks. Excellent information. I’m doing a paper on Choctaw Indians and found this most helpful. To what extent did CHOCTAW Codetalkers do anything in World War II? wERE THEY ANY Medal OF Honor Winners in World War II? Cheryl, The Choctaws were recognized as the first to use their native language as an unbreakable code in World War I. The Choctaw language was again used in World War II. Very good information. Lucky me I came across your website by accident. I’ve book marked it for later!